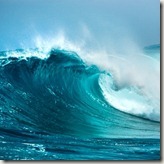 My first blog post, in October of 2006, coined the phrase The Second Great Wave of Philanthropy. In the years since, I’ve used the phrase much less frequently primarily because if you were going to assign a “Wave Number” to philanthropy, we’re probably in wave 5.2 or some other number which better recognizes the multiple phases that philanthropy has gone through. Still, the underlying concept of the Second Great Wave thesis is valid in my opinion. Today, I’m republishing my first blog post as background for a guest post from Sokunthea Sa Chhabra of the Case Foundation in which she lays out the ongoing mainstreaming of philanthropy, a critical element of the Second Great Wave thesis. You can find Sokunthea’s post here. However, as we embark on the 21st century, the traditional hierarchical system structure is collapsing. While the traditional top-down hierarchical system describes the way Rockefeller’s foundation distributed grants to charities, which then provided services for the public, a flat structure is the model of the Second Great Wave.